Volunteering as a group on a Medicine & Community project in Sri Lanka is an eye-opening experience. Despite the facilities being generally of a basic standard, this experience as Medicine volunteers will allow you to gain a great deal of valuable work-experience in a variety of departments. Groups have the choice, depending on local availability, as to where they are based. Projects Abroad offers Medicine placements in multiple locations, each with a variety of departments. Groups, depending on their size, are normally split to work in a variety of departments on a two week rotation system, with common departments being General Medicine, Maternity, ENT, Pediatrics, Obstetrics and Gynaecology. It is also possible to spend a few days working in neurology, the mortuary, rheumatology and the chest clinic. If you let us know your individual or group interests, we can usually arrange for you to work within your areas of preference. Your exact role within the hospital will be determined by your level of medical experience as well as the enthusiasm and effort which you show to the local staff. On arrival you will be introduced to your supervisor, their role is to ensure that you have the opportunity to learn as much as possible during your placement. 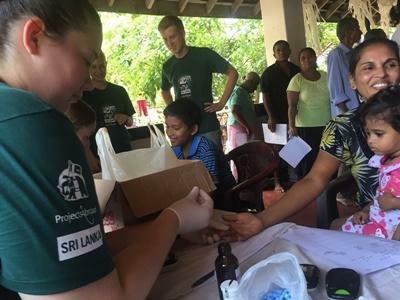 One important aspect of the Medicine and Community project in Sri Lanka is the organisation of a monthly outreach medical check on local communities. This also gives our volunteers a greater understanding of the medical system in Sri Lanka. Groups will travel to a local town to carry out basic medical checks whilst being supervised and supported by qualified doctors. This provides your group with the opportunity to carry out extremely valuable work in a community based environment. Depending on the size of the group, you will likely stay in a local hostel or hotel therefore making leisure time easier to organise. Volunteers get free time in the evenings and at the weekends to do with as they please, this may involve relaxing on the beach, exploring the culture and charm of the local town or venturing further afield and seeing what else this beautiful tropical island has to offer. Your group can join a standard Medical Project in Sri Lanka for two or three weeks if you don't have time to join us for four weeks or more. Please be aware that if you join the project for two weeks you will only be able to spend time on one or two wards during your time at the hospital.